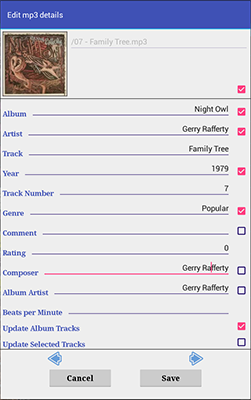 Tags allow information such as the title, artist, album, track number, and other information about the track to be stored in the file itself. Several options have been made available when editing your mp3, m4a or flac tags. Note the options at the bottom of the right screen. By selecting tick boxes, you can copy one or more tags to either other tracks on the album or to the tracks selected, as illustrated on on the left. The options "Update Album Tracks" and "Update Selected Tracks" are mutually exclusive. when you need to correct one or more pieces of information. For instance, when BPM is added for the track. Make the necessary changes and simply click Save. If you want to correct one or more tags for an album, simply select one track, correct the text, select the checkbox and "Update Album Tracks" checkbox, then Save. For instance, the year was incorrect. If the tags of your tracks are incomplete and android has been unable to determine which tracks belong to which album, manually select all the tracks from the album , update the necessary tags, tick the appropriate checkboxes and select the "Update Selected Tracks" checkbox, then Save. To change the albumart for the tracks, click the picture. You will be presented with pictures found on your device. Select the desired picture by clicking it. The screen will close and the new image has been written to the track. Copying this image to other tracks is the same as for the other fields. edited Albumart will be written to the Albumart tag of the track itself. Afterwards you will not require any albumart in the music folders. As New Playlist Manager currently displays albumart (pictures obtained by android media scanning), any changes to the track albumart will not be reflected in the display. You can check that the new albumart was written to the track by playing the track (using the app). You may see changes over time when android rescans its albumart cache and recognises the new picture. Changes to the other tags are written to the track but may not be reflected immediately in the display as android will need to rescan your media to update its media database. At the moment only mp3 tags can be edited if the tracks are located on the external sdcard. You will still be able to edit formats other than mp3 when located on the internal sdcard..